Located on the corner of Stafford Road. Application made Friday 8th February 1907 for a licence for premises to be erected on the Lichfield Estate on a piece of land abutting on Gordon Road and Stafford Road. About £900 would be invested in the building by brewers Steward & Patteson and it would be needed to provide for the 506 houses being built on the estate, 466 of which were already occupied. 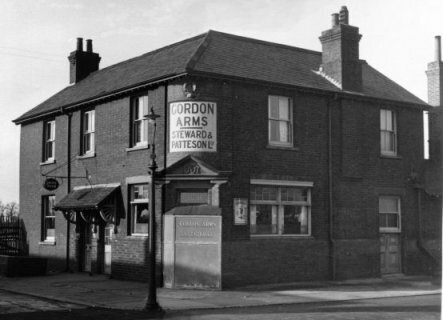 The only two other licensed houses in the immediate area were the LICHFIELD ARMS and the STATION STORES. Both these houses were owned by S&P so there was no objection to there being a third house providing for the estate. With the Station Stores only having a six day licence, there was currently only one house to serve on a Sunday. In the summer visitors complained, especially in bad weather, of the distance they had to travel in order to get their dinner and supper beer, and when they got there they had to wait their turns to get what they required. S&P advised they had recently acquired the EAGLE, on North Quay and they were prepared to surrender that licence and the full licence of the GOLDEN BALL. The rateable value of the new house was said to be £30 gross at least, and £25 nett. When questioned as to if £30 a year was adequate rent for an investment of £900, the representative of S&P replied that it was, but for no one except a brewer. GOLDEN BALL, George Street and the EAGLE, North Quay. Property purchased 23.10.1909 by S&P for £1280.